When Anthony publishes scientific claims from the edges of the field, generally they are quickly either confirmed or falsified. This is hugely educational for scientists of all kinds, to know how to counter some of the incorrect arguments, as well as giving room for those unusual ideas which tomorrow may be mainstream ideas. So it is not Anthony’s job to determine whether or not the work of the guest authors will stand the harsh light of public exposure. That’s the job of the peer reviewers, who are you and I and everyone making defensible supported scientific comments. Even if Anthony had a year to analyze and dissect each piece, he couldn’t do that job. There’s no way that one man’s wisdom can substitute for that of the crowd in the free marketplace of scientific ideas. Bear in mind that even with peer review, something like two-thirds of peer-reviewed science is falsified within a year, and Anthony is making judgements, publish or don’t publish, on dozens of papers every week. To my knowledge, I initiated in January 2008 the hypothesis that dCO2/dt varies with temperature (T) and therefore CO2 lags temperature by about 9 months in the modern data record, and so CO2 could not primarily drive temperature. 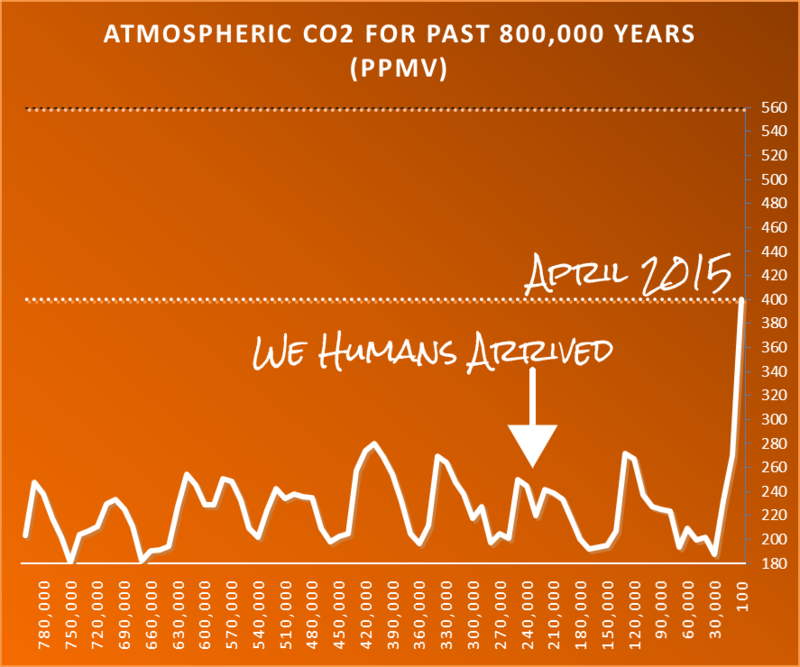 Furthermore, atmospheric CO2 lags temperature at all measured time scales. Allan MacRae is talking about global mean surface temperature. He claims to have found a nine month "lag" between global surface temperature and the amount of atmospheric carbon dioxide in the atmosphere. What he wrongly concludes from his "find" is that the greenhouse effect isn't real. 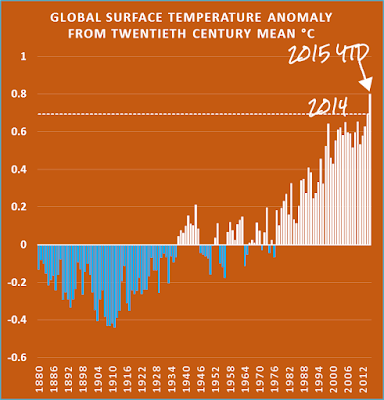 Oddly enough, Allan does accept that surface and lower tropospheric temperature has increased over time. 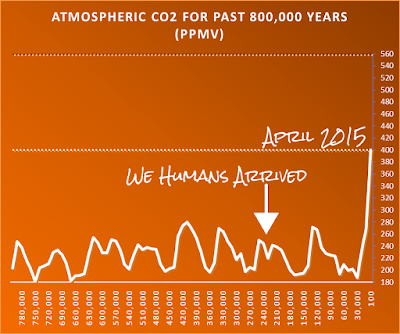 And that atmospheric carbon dioxide has increased with time. The latter is not surprising. As long as we keep tossing more and more waste CO2 into the atmosphere, using our precious air as a rubbish dump, it will keep accumulating. While Allan goes as far as showing that as time goes by, both atmospheric CO2 and global mean surface temperature increase, it doesn't take him long to go off the rails. What he did was plot the change in CO2 over time and the change in temperature over time. What he seems to be arguing against is that CO2 and global mean surface temperature aren't increasing in synch every minute of every day of every year. Yet no scientist would ever say that it should. Allan MacRae is building a strawman. Global mean surface temperature on a month to month and year to year basis is affected by many things, not just atmospheric CO2. It is affected by the seasons, by ocean influence (for example, ENSO), by volcanic eruptions - just to give a few examples. On a month to month and year to year basis, atmospheric CO2 is affected by how much CO2 is emitted (how much fossil fuel is burnt), which can be less in global economic downturns; and by the seasons (photosynthesis); and to a lesser extent by the weather (affecting how the number of photosynthetisising organisms, or the ocean temperature). Allan then uses another logical fallacy, the non sequitur. He effectively claims that because temperature caused CO2 to rise or fall in the past, it can only be temperature that's causing it to rise in the present. That doesn't follow. It's like saying that because it was interest rates that caused your savings to go up or down in the past, it can't possibly be your increase in salary (or job loss) that's caused your savings to go up (or down) in the present. Allan MacRae doesn't try to explain the rise in temperature. Is it magic? The other big problem with Allan's article is that he hasn't even tried to explain what is causing the increase in global surface temperature. He claims it's just a natural and irregular cycle but goes no further. He doesn't explain what he thinks is driving this "natural irregular" cycle. Does he think things get hot by magic? Go on, try it yourself. Fill a saucepan with water out of the cold tap, and put in on the stove. Don't do anything else. Measure the temperature of the water in the pot every hour for 24 hours. At the same time, measure the temperature of the room. Wait till they equilibrate and then keep measuring the temperature of both. Does the water in the pot heat up more than the room temperature? Now turn on the stove under the pot. Let the stove heat up. Keep measuring the water in the pot and the water in the room. Does the water in the pot heat up more quickly than the room? What could have caused that? If you were Allan MacRae, you'd be arguing that it wasn't the fact that you added heat by burning fossil fuels or from the sun (if you've got solar power) or wind (if your electricity comes from windpower). He'd be arguing that it doesn't matter what caused the water in the pot to heat up. The fact that it heated up is sufficient to show that temperatures go up for no reason at all. Allan to his credit did get as far as acknowledging that the fluctuation in atmospheric CO2 within a year is largely driven by photosynthesis. However nowhere does he try to explain what is causing the rapid and inexorable rise in global surface temperature. Not anywhere that I could see. So does he think that pots of water heat up by magic? Does he think that the oceans, the surface and the air can heat up by magic? Anthony says he doesn't know if Allan MacRae (and Murry Salby) is right or wrong. Anthony doesn't know if the world is heating up by magic, or if the greenhouse effect is real. He harbours all kinds of conspiracy theories about this, as if he doesn't even know if all the melting ice and warming oceans and land masses really means that it's, well, getting hotter. Allan doesn't keep up with scientific progress, either. 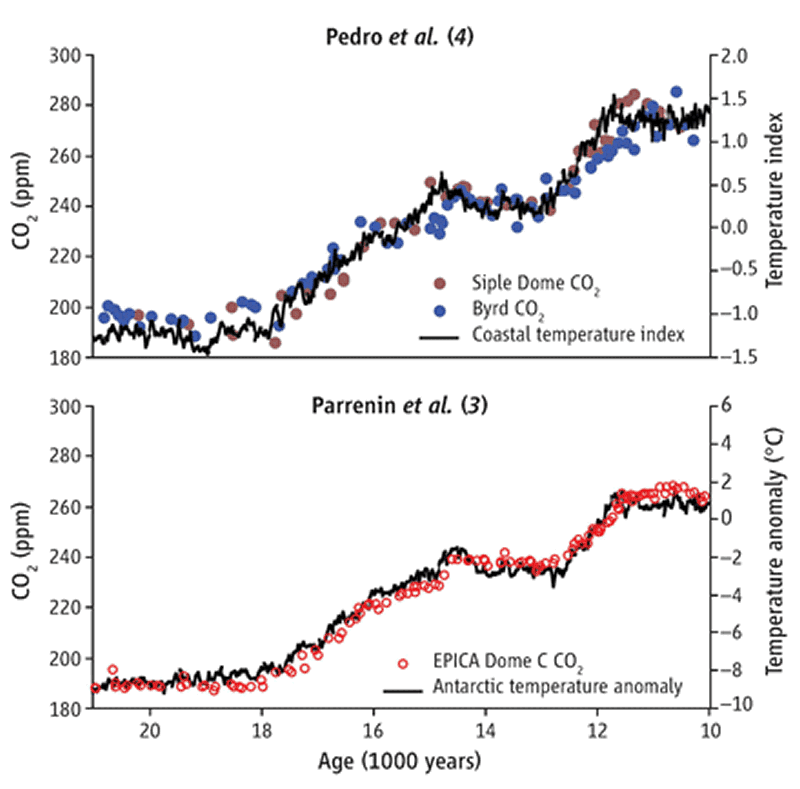 He wasn't aware that as earth came out of past glaciations, the time lag between the observable rise in CO2 and the rise in temperature can be very tightly coupled, much more so than previously thought. That's been found by re-examining ice core data from Antarctica, using more accurate measurement techniques. What happens is that CO2 is released from warming oceans. 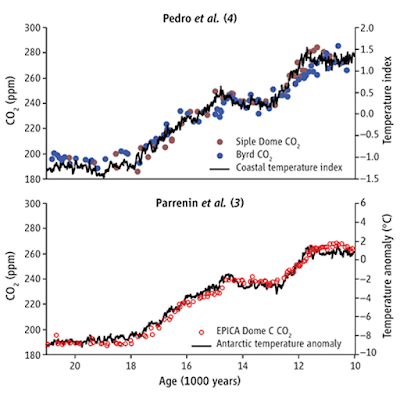 The added CO2 means that temperatures rise even faster. It's a feedback loop. Deniers have a tendency to cherry pick bits of science that they think supports their wrong arguments and discard everything else. Deniers don't give up old ideas readily either. They aren't open to new knowledge. Think how many of them still run with outdated and incomplete meme of the "800 year lag", instead of what is now shown to be a "very tight coupling". Or how many of them claim that a simplified schematic in the first IPCC report is "right", while all the science of the past 25 years "must be wrong". Look at how many deniers still can't accept that global surface temperature of the last one or two thousand years is shaped just like a hockey stick. You'll occasionally see comments from deniers who think that it was hotter in the 1930s than it is today. Scientists spend a lot of time working out what causes changes in climate, whether they were caused by something in nature, like massive volcanic eruptions, or earth's orbital variations; or something that we did to upset the balance, like burning fossil fuels. Deniers can't be bothered with science. They just claim "it's natural" without saying what caused this "natural" change. One thing that doesn't change a lot is denier's alarmist predictions of global cooling. Or how woefully bad they are. They are often in the near term rather than too far ahead, so it's easy to show how wrong they are. And for some unknown reason they are often made during or just after another "hottest year ever" (like 2014 and, so far, 2015). Just like Allan MacRae's prediction. “Climate scientists” are intensely stupid, and must be intentionally, willfully so, to have so completely confused cause and effect, hoping that the hoi poloi wouldn’t notice the Mann behind the curtain. owenvsthegenius doesn't accept known chemistry, that burning hydrocarbon releases CO2 and uses up oxygen. He's probably never been in a room with a kerosene heater. Bill H opts for the "something else" - the "it's magic" explanation. Well, That is an interesting presentation which, if correct, would make the CO2 monster look like the CO2 droplet… The difference of changing the feedback being from being very Positive to very Negative makes the CO2 monster a drip… The lag so nicely shown makes it impossible for it to be anything but caused by something else. The more I get into the CAGW debate the more on its face the alarmist camp falls. It’s like a series of pratfalling stooges lining up with more infuriating claims. And logic be damned. Zoom into any CAGW claim and before long the underpayment looks stupid. I’m quite certain the math is also stupid. Every single claim is stupid. It’s too much, I’m so glad that there is a sober forum like this one to help people navigate through the falsehoods that make up CAGW. I now have enough sense under my belt to unseat any alarmist at any given time on each of their stupid points. So thank you Anthony, thank you Lord Moncton, thank you to the locals here at WUWT. It’s comforting to be able to bring calm to my family and friends whole others are subject to the hysteria. Anthony, why do you not have an opinion about Allan MacRae’s post? It appears to be so simple? I have also learned in my high school physics class that all electromagnetic radiation travels at the speed of light. The ‘warmists’ say that CO2 is a ‘radiative’ gas that absorbs and emits long wave radiation and warms the planet by reflecting back LW radiation emitted by the earth’s surface. On the face of it, this sounds plausible. However, since LW radiation travels at the speed of light, no matter how many times it is reflected back and forth, in an instant it is gone (into space). It strikes me that rather than warm the planet, CO2 is busy stripping heat out of the atmosphere at the speed of light! Could it be the boring O2 and N2 molecules in the atmosphere that are actually retaining the heat by acting as a blanket? In other words, what the ‘warmists’ are saying is again the opposite of what is actually happening? Could this mechanism help explain why CO2 is really the dependent variable? Again, I am not a scientist and I know we are not supposed to question the radiative physics behind the greenhouse gas effect but can one of the real scientists here explain where I am going wrong with my high school physics? Thanks. He asked for help from a "real scientist", which is not very useful, given that very few real scientists bother with WUWT. p.g.sharrow isn't a real scientist but he responded anyway, and wrote something about plant food. Nothing to do with the radiative properties of CO2. @ Bernard Lodge; You have it exactly correct.Carbon Dioxide does not act as a greenhouse in preventing heat lose. Oxygen and Nitrogen act to prevent heat flow as insulators, A real greenhouse effect! TonyL gave a longer and better answer, which you can read here. "So does he think that pots of water heat up by magic?" Its a wonder the Wutters don't demand money from their electricity suppliers for all the electricity they must think they generate when they boil a kettle. I look forward to Anthony Watts headlining all his posts about new papers with "Presentation of Evidence Suggesting…" instead of "Claim:…"
I present this for discussion, I have no opinion on its validity: They can have a "pause" or a nine month lag between temperature and CO₂, but they can't have both. Wow. Psychologists could spend years studying the antics of the denizens of WUWT. They really have no clue how ignorant and incompetent they come across, or how nutty they sound. ==> "Today he takes a step back from that, and is now claiming to have no opinion on the subject." I saw that article from Anthony and had a similar reaction. Bernard Lodge should do a search on Youtube with 'CO2 IR absorption'. The IR is absorbed and then re emitted in all directions. Yes this happens at the speed of light! There is a small delay while the charge dipole moment of the CO2 is vibrating after absorption before re emitting the IR photon in a random direction. MacRae has previous when it comes to cooling predictions. In an article for extreme fake sceptic website 'ICECAP' in September 2008 entitled "Is This The Beginning of Global Cooling" MacRae answered his own question with an emphatic "YES". He based this on a high order polynomial trend he managed to fit to the (then) UAH data. 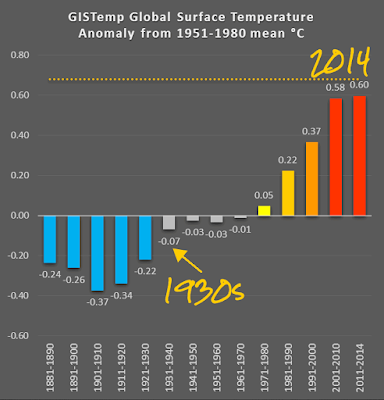 The same trend now shows warming, even using the latest UAH data set. 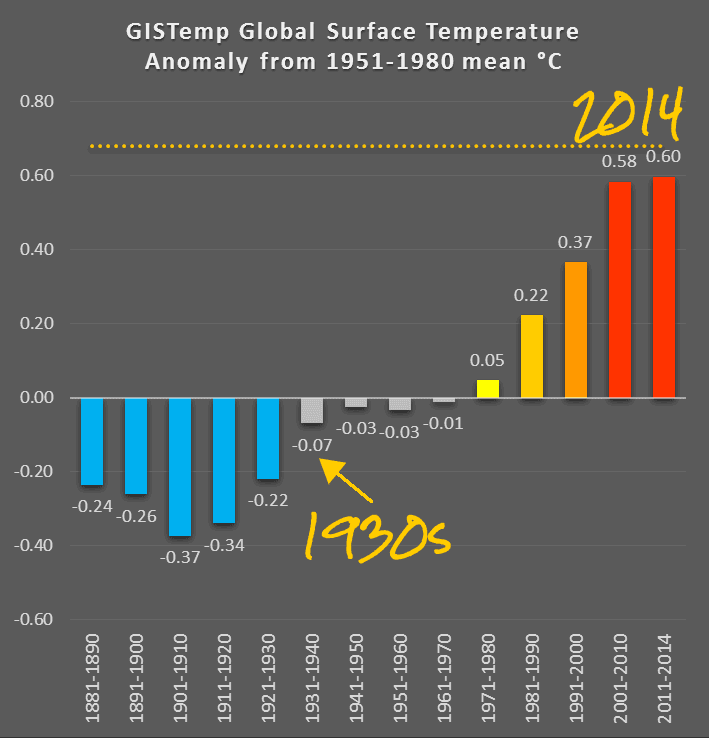 "You'll occasionally see comments from deniers who think that it was hotter in the 1930s than it is today." You're right about them hanging onto business suits that no longer fit. That's a relic of 10+ years ago when it was _possible_ to argue that the 30s - in the lower 48 USA - was their hottest decade. Back then it was the classic, insular 'America = the whole world' issue. Now it's a total denial of both global and local reality. Most of us throw out our moth-eaten or horribly out-dated clothes and other possessions. Not this crowd. The level of inanity of R. Courtney is nothing, if not breathtaking! "We know the equilibrium of the carbon cycle has altered for some unknown reason with a result that atmospheric CO2 concentration has varied, and that is about all that we know." ...well, the scientists must be wrong about that because, you know, if I can't understand it how can they understand it? Completely blinded by their ideology/greed. Useful idiots. More like playground bullies, actually; the way they carry on at LOL WHUT?! Will be the downfall of us all if inaction continues, unfortunately.